Can great technology and elegant UX solve the problem of how to fully engage audiences with online video while still providing a “lean back” viewing experience? Or are these two modes of experiencing media forever incompatible? Come find out as we look at the case study of OVEE, the Online Video Engagement Experience, a one-of-its-kind social screening platform created by the Independent Television Service with funding from CPB and in partnership with software development agency, Carbon Five. 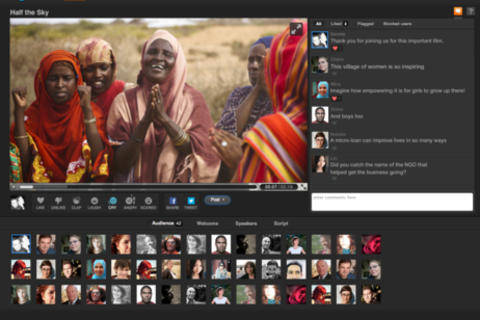 OVEE was created to meet the challenges of presenting high quality film and television content, and building a unique real-time engagement experience around it for teachers, public television viewers, community organizers and dedicated fans. Meet the lead developer and lead strategist who have committed to this search for the holy grail of online video experiences. Christian is a software developer, technical lead and agile coach. He's passionate about helping teams find creative ways to make work fun and productive. Working on many projects with as many different teams has provided a deep pool of experience from which he has learned. He serves as the Director of Engineering at Carbon Five, a boutique software development consultancy with offices in San Francisco and Los Angeles. When not slinging code or playing agile games, you can find him trekking in the Sierras and playing with his daughters. Dennis Palmieri is Director of Innovation and Media Strategy at ITVS — the Independent Television Service — the largest public funder of independent film in the country, and the leading provider of indie content to PBS. Dennis is a 15-year veteran of marketing communications, public policy and community engagement in the non-profit sector, leading regional and national teams Amnesty International USA, the Hispanic Scholarship Fund, and serving more than five years as Managing Director of Communications at ITVS where he focused on building audiences and brand for the Emmy Award-winning PBS series Independent Lens. Dennis has an M.A. in International Relations from the University of Washington in Seattle. He lives in Oakland, CA.